As artists in Christ, we experience harmony when we honor the faith walk, our artistic expression, and our career life and ambition. Since the just are supposed to live by faith, we need to understand what being a career artist looks like inside the faith process. In this episode, Marlita explores patience as an element of faith. Harmony between faith, art, and career is about all parts being accepted and honored, given full expression in the same space. All parts: the faith walk, the artistic expression, and the career life and ambition. This harmony can only be experienced when art and career are aligned with God and achieved by the working of faith. Rom 1:17 tells us “the just shall live by faith.” If you have accepted Jesus as your Lord and Savior, you are one of the just. If you have to live by faith, and your career is part of you, then your career must be worked and accomplished by faith as well…at least if you want the fullness of what God showed and promised you. Harmony between faith, art, and career is experienced when we navigate our career in a way that honors the working and process of faith. If we understand how faith works, when we experience certain things in our career that are a necessary part of the faith cycle, we won’t be thrown off. So we have to learn what being a career artist looks like inside of the faith process. One element of faith is patience. Unfortunately, it is an unavoidable part of faith. Well, I shouldn’t say unfortunately. It’s like going to the dentist: it’s good for you, but it never feels good. Much love to all the dentists out there. Thank you for helping us keep our teeth. 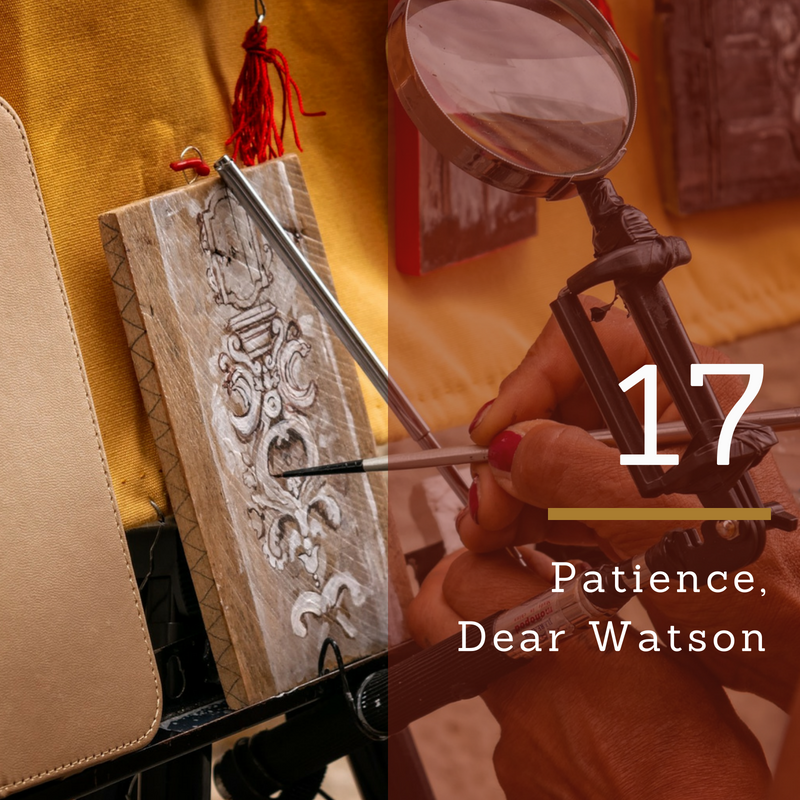 Like the dentist, patience is good for us and produces so much in us, but will probably often be misunderstood by us, at least in the beginning, and until we mature and learn to honor its presence and contribution. For the vision is yet for an appointed time and it hastens to the end [fulfillment]; it will not deceive or disappoint. Though it tarry, wait [earnestly] for it, because it will surely come; it will not be behindhand on its appointed day. In Luke 8:11-14 (NKJV), Jesus gives an explanation of the parable of the sower. “Now the parable is this: The seed is the word of God. Those by the wayside are the ones who hear; then the devil comes and takes away the word out of their hearts, lest they should believe and be saved. But the ones on the rock are those who, when they hear, receive the word with joy; and these have no root, who believe for a while and in time of temptation fall away. Now the ones that fell among thorns are those who, when they have heard, go out and are choked with cares, riches, and pleasures of life, and bring no fruit to maturity. [Mark 4: 19 says, “and the cares of this world, the deceitfulness of riches, and the desires for other things entering in choke the word, and it becomes unfruitful.”] But the ones that fell on the good ground are those who, having heard the word with a noble and good heart, keep it and bear fruit with patience. The thing that struck me most about patience is that obstacle and difficulty are an inherent part of it. Like you don’t get water without wet, you don’t get patience without difficulty. But, from the verses above, we know that what God has shown you has an appointed time, it will come pass, but it will come to pass with patience. This relieves so much for me. I hope it relieves things for you. If you’re having a baby, and you know that nausea and swollen feet are what comes with having a baby, you can deal with the nausea and swollen feet. And you can deal with them because you know their presence doesn’t mean the baby is no longer coming. You know their presence is an indication that the baby is coming. You understand that these experiences are temporary and you are willing to endure for the opportunity of holding your baby when the time comes. We have career hopes and desires, things we are believing God to bring to pass and let us experience as artists. That is our, and God’s baby within us. Moments of difficulty and hardship we experience, in attaining that dream, are like the swollen feet and nausea. Also, with having a baby, you understand that time is an unavoidable necessity. Now, there is a difference between having a baby and our dream. With a baby, you know it’s approximately nine months and you can manage your expectations around that. With our dreams, we don’t have an exact time. And the more time we have to wait, the more things try to slip in like doubt, confusion, regret, etc. I get that. Nevertheless, just like time doesn’t make you doubt if the baby will ever come, we cannot let time make us doubt that our dream will also come. It just has a longer gestation period, but it is just as certain as a natural baby. What helps us be, and remain patient? A major tool is remembrance. Throughout the Bible, when God was bringing His people into promise, He would often have them make memorials along the way. You would also see God’s people memorialize something God did for them by making an altar or some other indicator. What do you have to remember to be or remain patient? One, you have to remember what God promised you and you have to keep that promise present in your mind in its original form. Hab. 2:2 tells us to write the vision and make it plain. Write down what God showed you, what He told you about your art life; because it does have an appointed time. Two, you have to remember that, in God, and from His perspective, this is a done deal. It doesn’t matter how much time passes. It doesn’t matter if circumstances become unfavorable or no longer possible by your, or someone else’s determination. That doesn’t change the finality of God’s promise to you. Three, you have to remember that God’s way of doing things and getting them accomplished are not like ours; and we have to make room for the possibility that He can fulfill His promise to us by means that are foreign to us. The other day, He brought the 5-W’s to my mind, and the one H. There is who, what, when, where, why, and how. IF is nowhere in that configuration. IF needs to be a settled matter for you. If God said it, that’s it. There is no IF. The other details are none of your business, until God makes it your business when He tells you. But, the lack of details does not equal the lack of absoluteness. Just because you don’t know when or where it’s coming from, it doesn’t mean it’s not coming. And four, we have to remember that patience is a necessary part of faith, and time is a necessary part of patience. We have to remember that time also brings the temptation for comparison, regret, doubt, resentment, and a host of other things… but they are all just temptations, and they are not the end. There is a promise for us that exists on the other side of time’s swollen feet and nausea. Luke 8:15 says the person who kept the word brought forth fruit of that word with patience. One definition of patience involves self-possession. It is important for us to keep our vessel in check, to keep our mind and thoughts in check. Let’s not be like the other Luke 8 hearers, who didn’t remember the above things and self-aborted their baby because they allowed themselves to get caught up, carried away, and talked out of what God said He would do, out of what they absolutely would have received if they had just waited, stayed in place and allowed patience to do its work. What are the thoughts, anxieties that make patience difficult? What is one thing that you could put into practice to help yourself successfully journey in patience? Next Post Ep 18 – How’re you seeing what you see?